TopVue Air Multifocal contact lenses are designed for people with presbyopia and are made from an innovative, third generation silicone-hydrogel material. 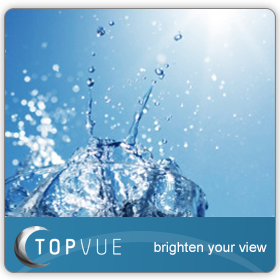 TopVue Air Multifocal are characterised by high oxygen permeability while also maintaining a high water content. The design of TopVue Air Multifocal features several optical zones that guarantee quality vision correction at all distances and also exceptional comfort. You can also buy our larger packages of six TopVue Air Multifocal lenses. Presbyopia is a common eye disorder associated with aging. Impaired vision sometimes begins to occur around the age of 40 due to the loss of elasticity of the eye lens. Because of this, the eye is not able to adequately focus at near and far distances. TopVue Air Multifocal contact lenses feature multiple optical zones. This principle of alternating individual optical zones in concentric circles uses the natural physiological properties of the eye – the pupil contracts when focusing on close objects and widens when looking into the distance. Correcting the optical zone for near vision is concentrated in the center of the lens, while towards the edges are zones for correcting vision at longer distances. Which addition (ADD) should you choose? TopVue Air Multifocal contact lenses feature four additional values. In the event that your measured value is between two of these, select the value that is lower. If necessary, in the case of a dominant eye, the dominant eye should be with a higher value and non-dominant with lower. TopVue Air Multifocal contact lenses are packaged in a blister pack that includes an enriched wetting agent known as sodium hyaluronate, which is completely compatible with the physiological environment of the human eye. Their technologically advanced silicone-hydrogel material provides TopVue Air Multifocal extremely high oxygen permeability. The transport of atmospheric oxygen to the cornea occurs through microscopic channels. The ability to transfer oxygen (transmissibility) is 100 Dk/t. Water content is a very important factor in the healthy use of contact lenses. TopVue Air Multifocal feature a 45% water content. With their high volume of water, they retain a high degree of hydration throughout the day. The amount of water contained in TopVue Air Multifocal also reduces the accumulation of deposits on the lens surface. Many thanks for the free delivery this week. A welcome surprise when one needs to order lenses directly following the holidays! Much cheaper than the multifocals I found on the high street. Great value, and the lenses arrived within 2 days. Can't complain about the service either. I'm relatively new to multifocal lenses, but gave these a try after finding my other lenses (that my optician recommended) a bit expensive. So far very pleased with the results - comfortable, and better for my budget. Very helpful service. I got all the information I needed. Many thanks. Good communication and simple ordering process. Great first experience with your company. Nice lenses. Took some getting used to, but overall I've been quite satisfied. Easy to apply, and quite ok to wear for longer periods of time. I can usually get through 8-9 hours with no dryness. Great clarity of vision with these lenses. They don't seem to dry out. I appreciate the quick communication from your company, too. Nice lenses, they seem to be of a high quality. I've had no issues with them, and find them quite comfortable. Excellent service from your side, as well. I entered my address incorrectly, and your representative contacted me immediately before dispatching to correct it. Otherwise my lenses would have ended up across town. Excellent service and attention to detail. Very good lenses and prices; my order was delivered the very next day with DHL. Great service. Excellent lenses- easy to wear. Especially comfortable as they never seem to get dry or blurry. Nice price, especially for bifocal lenses. Overall I'm quite satisfied. I normally can't wear lenses for more than a few hours, but these get me through the day with no irritation at all. Excellent product, thanks. Wonderful lenses, smooth ordering and overall great service. Many thanks. Hi, Rob, It is generally healthier to take them out at night as bacteria will accumulate and be trapped under the lens above your eye. However, yes, they are monthly lenses with an active life-span of 30 days. I usually wear Biofinity Multifocal but your site recommended the cheaper option of Topvue air multifocal. Can you tell me the differences please so I can make an informed choice. Hi I normally use myopia glasses with astigmatism correction.recently I have to to take off my glasses to see near.without glasses I have no problem in seeing near.can you please recommend what type of contact lens will be good for me? Hi, Anirban, You may need multifocal astigmatism. However, we don't currently supply that specific type of lens. We recommend visiting a licensed optician in this case. Do these lenses have a handling tint? ? Can these lenses be left in at night? Hi, Tracy, While these lenses are good for 30 days, it is generally healthier to take them out at night, as bacteria will accumulate and be trapped under the lens above your eye. Hi, Paolys, Thank you for your recent comment. Unfortunately, as we are not licensed optometrists, we are unable to off trial lenses or samples. Any lenses you buy will be charged per lowest market price. Please feel free to contact us should you have any further questions. Thanks for leaving a comment. The lenses have a 30 day replacement schedule. Can these contacts be worn for day and night?